Thanks, NN. MPA: yes. You definitely need spaceships. I bet Josie would love a spaceship! These are awesome, and your tree looks so cute! Love the tree skirt. I'm SO doing that next year. i love the little touches - the 2 beads, and the orange and white combo. My cat is going to LOVE these! Ohhhhh, I love these spaceships! Nice and easy! thank you for sharing! I love this and am wondering how many times I will stick my thumb with a needle if I try it. I wanna see a picture of the whole tree! Love it. 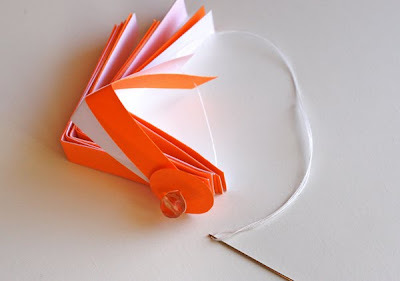 What a great way to use up some paper scraps. Thanks for sharing. You just CAME UP with that!? Amazing! 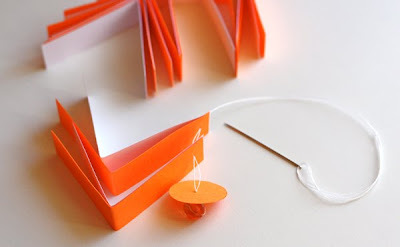 I recently came upon your blog because I love orange too! You have so many inspiring ideas! Thanks for sharing! Too cute! those came out really nice. That is the cutest thing! And it goes perfectly with your tree skirt fabric (but you knew that). 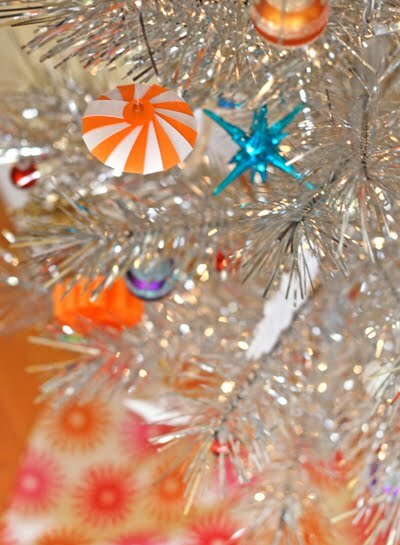 I love your silver tree too! Love it. You are amazing can't wait to see what you do next. I love orange! I adore you! This is crazy good idea and beautiful resul! I am such a fan of yours! This ornament is brilliant, simple and complex all at the same time! Thank you for sharing with us.... my tree will wear quite a few of these this year! So very cool. You make it look so easy to do. Uh oh--I think I need to try these crazy space ships. I'm currently struggling through the spiky Polish stars, an overly ambitious project for some of my coworkers. Why not another? this is so gorgeous and beautiful. You made it again! That's so cute! I love my paper ornaments and I'm amazed they've held up over the years. 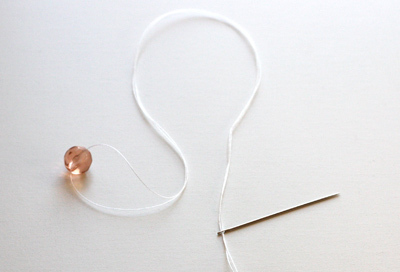 maybe somebody already said this but i just made one and I realized I could put a long skinny bead INSIDE so that there is no gap when you pull the thread taut to finish it up. you are so genius! what did i do before discovering your blog?! I absolutely love these! I'm making some tonight! nice post! do you think this would be possible also with old christmas cards or does it work only with paper? I love these! I used someones suggestion to put a long bead in the middle and I used 20 strips of paper and mine came out perfect (no gap)! I used them and another kind as an extra special gift for my mom. She thought I bought them. These are just perfect for my Asian Birthday Tea Party Theme. I'll use them as napkin rings. Thanks so much for the great instructions! Hi there! I'm in love with everything on your blog. 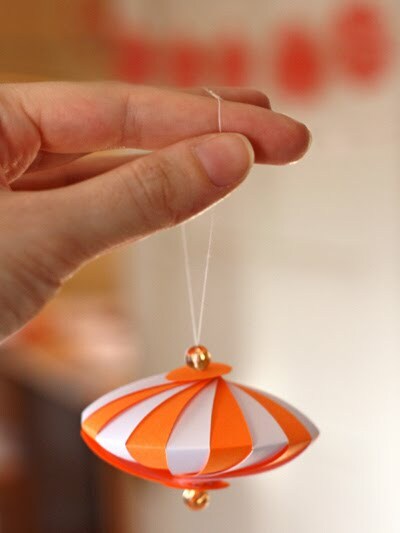 I just did a post over at kiwiactionhero.blogspot.com about making this ornament. I'm excited to try more of your tutorials! this is SO darling! I found your blog through COLOURlovers and I'm SO glad I did! I recently put up a post about loving the color orange, and I just might repost it with a link to your blog, if you don't mind! Great ornament design, thanks for sharing it! I also had a go at making one. I think they are right about a bead in the centre because it would help. I couldn't get mine to stay faned out either??? Or a length of drinking straw. That might work. I am also considering wire. I tried it with beading thread, and can't get it opened properly. A spacer of some kind would definitely solve that problem.... Fun little evening project for me, while my teenager planted herself in front of my computer. Thanks! Oh, I like the straw idea! beautiful! I just wanted to let you know this ornament has been feature in the Ten Fabulous Christmas Ideas post at Freehand Scraps blog, which will be posted next week. 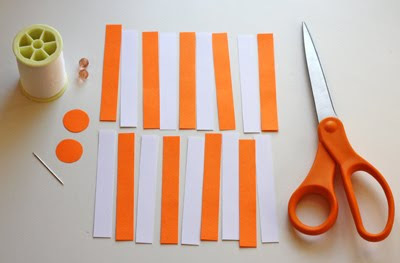 My grand daughter and I made these this afternoon to hang from a chandelier... we ended up using construction paper and made only 16 strips... worked out great if we didn't pay any attention to the gap but used instead so they all turned out like spirals. Thank you for sharing this fabulous, fun idea. I made 2 and I don't know what I am doing wrong, but it's not working for me after the 2nd side starts to make it come together. Thanks for letting me know; I found a few more, too. I really like this. I think this would look great with red and white strips. 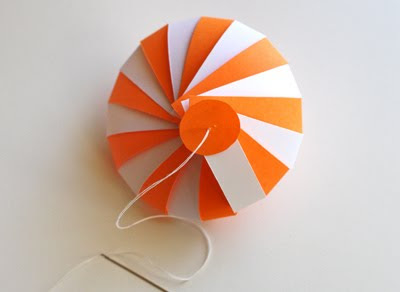 If you put a bead between each paper as you thread, you'll end up with a nice holiday swirl instead. Can you post more photos of the steps please? Oh, I really like this one! Great work! waouh, very nice! Thank you for sharing your tuto, I think I will do one or more fore the tree - or just for the pleasure! This was great! I made one with silver glitter paper and b&w striped scrapbook paper, and it's beautiful! I didn't have a straw, but I put a few beads in the center. Not sure what I think for ornaments, but make them tiny for earrings!! Should be fun! this is so adorable!! thank you for the sharing the detail descriptions! Thank you for the lovely post. I will try this in my classroom. Show my students this geometric shape. Lovely. This is way cool! Thank you for sharing the idea!! one question, '' mean cm?